After travelling to Nusa Dua and Ubud, our next stop in beautiful Bali was Seminyak – one of the trendiest parts of Bali with great boutique shopping, high-end restaurants and bars, as well as some great day spas and hair salons! However being just north of Kuta, there can be a fair bit of traffic. You will see plenty of people on motorbikes, and when I say plenty, I mean almost everybody! Parents will even carry their babies on motorbikes! (Cringe!). Our home for the next 7 nights was the W Retreat & Spa, Seminyak. This resort was stunning! It was very modern, the rooms spacious, and as it was situated right on the beach the sunsets were just beautiful (always with a cocktail in hand)! The W had some great restaurants, which were all very accommodating for gluten free dining. I hit the jackpot third time lucky with gluten free bread being available! Breakfast at Star Fish Bloo, in the resort was fantastic. Although it was buffet, you could order anything you wanted from the a-la-carte menu and it was included in the buffet price. 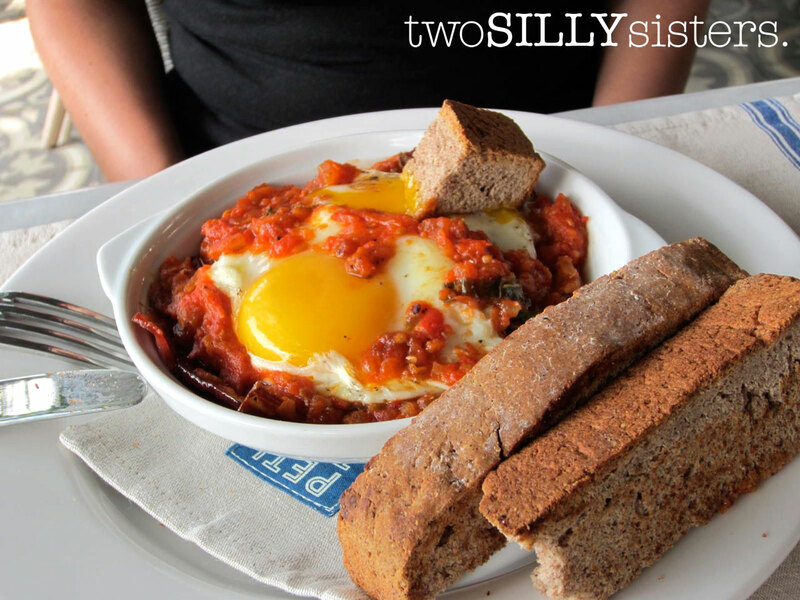 There were quite a few interesting breakfast dishes which could all be made gluten free and I made sure to try out a few! Dishes included eggs benedict, French toast, scrambled eggs with lobster and mascarpone, and croque de monsieur, which was GF bread served with prosciutto, a fried egg and a creamy cheese sauce. Oh and the hash browns were also gluten free! There was also a selection of Asian breakfasts although the GF selection was minimal. I have never been a big fan of eating Asian for breakfast so I wasn’t too fussed, but just for the sake of trying something, one morning I did give the rice porridge a go. This was rice boiled in coconut milk and to be honest it just tasted like salted boiled rice. Not my kind of breakfast, sorry. 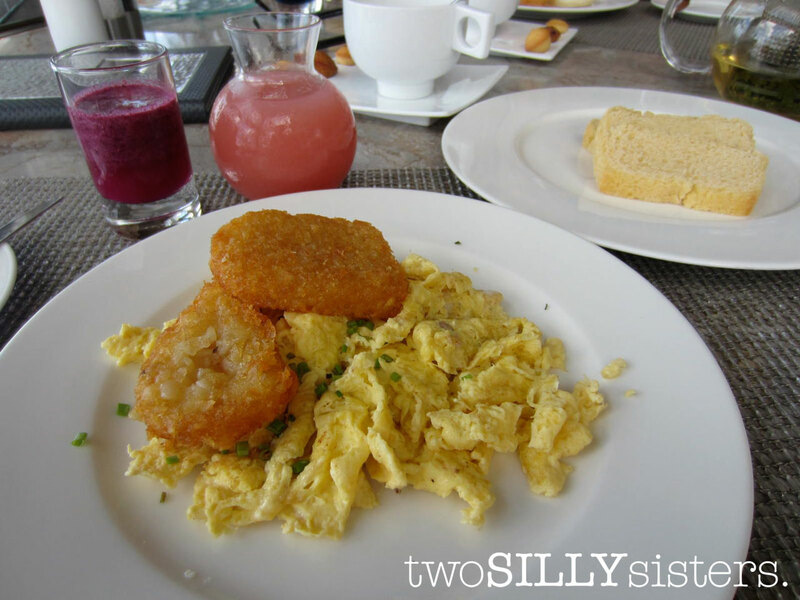 While we are talking breakfast, we did venture out of our hotel a few mornings and were extremely pleased with the food we found. The Deck, part of the Semara Resort & Spa Seminyak, is a casual dining restaurant and is open for breakfast, lunch and dinner. GF bread is available and they can make a variety of dishes GF, just ask the waitperson. Petitenget Café was another favourite. They too offered GF bread! I had a delicious breakfast of potted eggs, with streaky bacon and sweet chilli jam salsa. Yum… it was so good! The shopping in Seminyak is fantastic! I cannot stress this enough, take a half empty suitcase so you can fill it up! Majority of the shops are boutique style so you will find it a bit of a challenge to bargain. Usually the prices are set, and that’s what you pay. I picked up some beautiful dresses, bags and shoes. The homewares are also to die for! I would love to be able to decorate my house in Balinese style furniture! 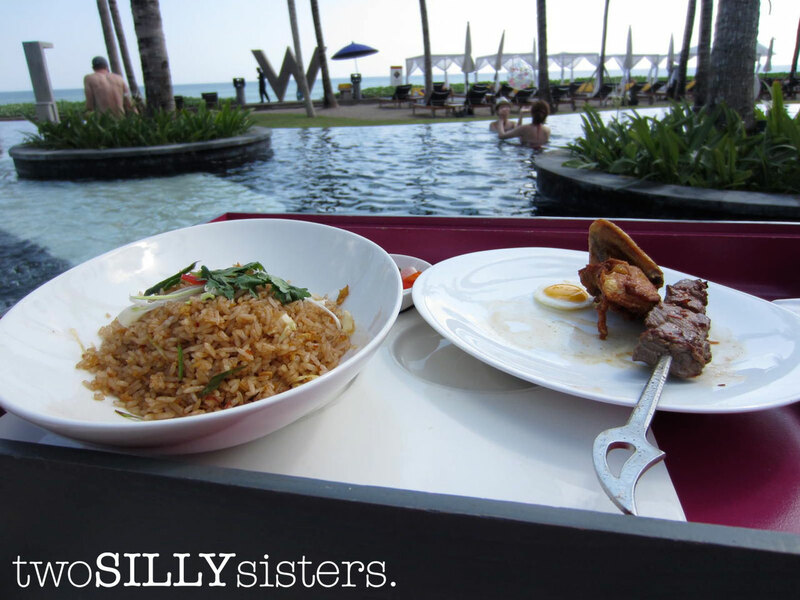 After watching the sunset at Ku De Ta – a beautiful open bar situated right on Seminyak beach – while sipping delicious cocktails (try ‘The Monk’ – an exotic combination of vodka, lychee and guava), we decided it was time for a feed. Ku De Ta does have a restaurant however the menu was quiet modern and seemed very westernised. 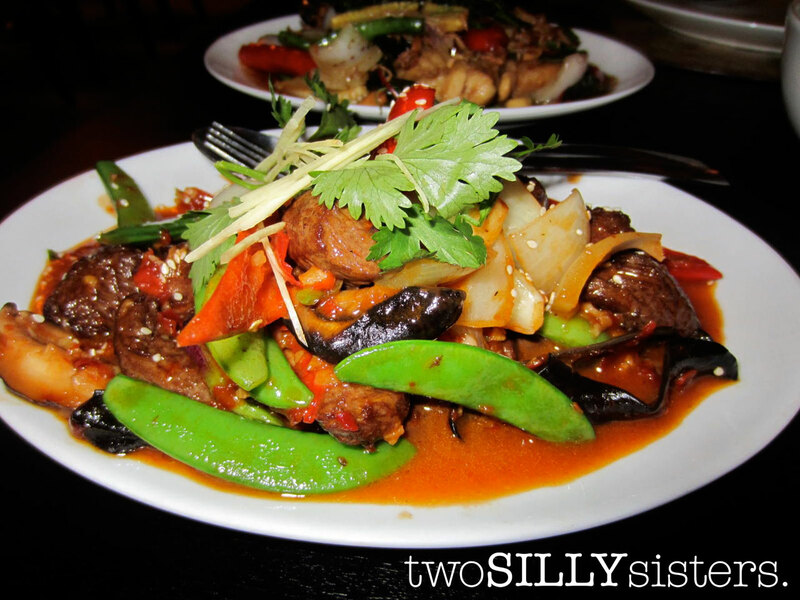 We were craving Indonesian flavours so we headed out, on the hunt for a good gluten free Indonesian meal. 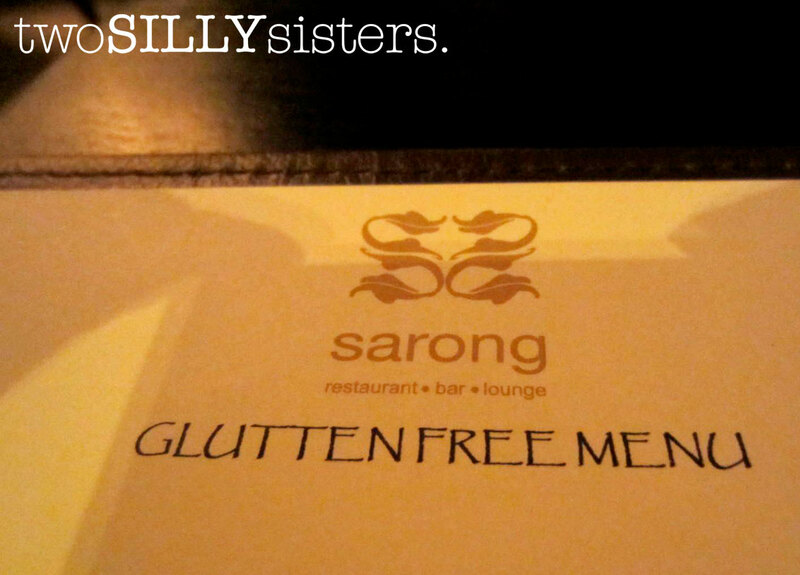 We found a place called “The Living Room”, and luckily for me, when I asked about gluten free they understood straight away! The setting was absolutely gorgeous. It was like being inside a grand master suite. The food is more towards the fine dining end, but so worth it. For starters we had Beef Carpaccio with wasabi miso oil. 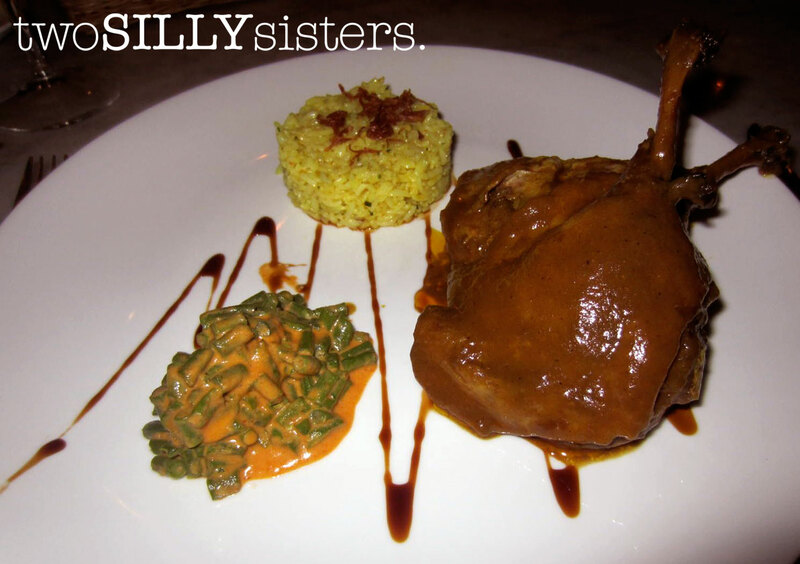 For main I ordered a more traditional dish of Duck legs prepared in a tasty Balinese Betutu sauce, served with fragrant lemon yellow rice and baby beans. So delicious! The next night we decided we wanted to check out the much talked about ‘Sarong’, which was not far from the resort we were staying at. I recommend making reservations for dinner as it can get quite busy and you don’t want to get turned down from such an amazing place like this! It doesn’t surprise me that Sarong has been voted as one of the top 5 restaurants in Asia! So already being impressed, when I asked the waiter if he could recommend some gluten free dishes and he brought back a GF menu, you can only imagine how ecstatic I was! In my head I was jumping up and down with excitement and doing somersaults around the room. After ordering our cocktails (number one priority) we decided on our entrée. We ordered the “Raw tuna betel leaf with lemongrass shallots & lemon basil” and “Salt & pepper squid with Vietnamese dipping sauce”. 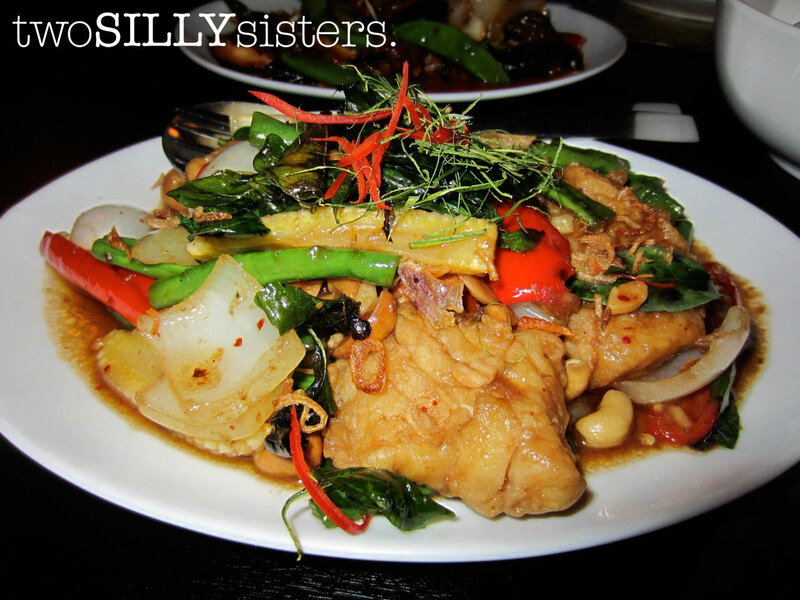 Yes people, the salt and pepper squid was gluten free! 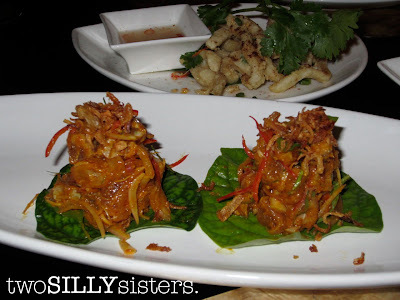 The entrées were equally as delicious, with the betel leaves absolutely bursting with flavour! For mains we shared a “Snapper with chili jam, long beans, baby corn, red chili & Thai basil” and “Chili beef with shitake mushrooms, snowpeas, capsicum & green shallot”. Both were just as good as the entrées. The food was delicious and fresh, the service was immaculate, and the décor beautiful. We could not find a fault in this place. Needless to say we also returned here on our second last night because we just enjoyed the dining experience so much! This time we shared the “Raw tuna betel leaves” as well as tasting the “Chicken betel leaf with flat leaf coriander, lime, roasted chili and capsicum relish”. 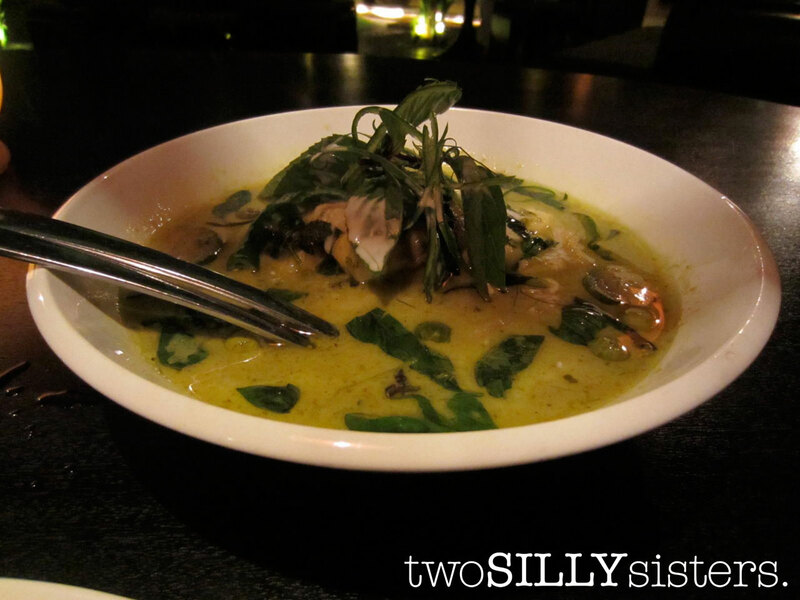 And for main I had a “Light green curry of snapper with Thai eggplant, oyster mushrooms, coconut cream and sweet basil”. Wow wow wow! Both times I was completely satisfied! We watched many sunsets while in Seminyak. The most famous place at the moment is “Potato Head Club”. It’s a great open bar, overlooking the beach. Set out with daybeds and a pool, as well as a sheltered bar seating area. Potato Head Club was not as fantastic as we had hoped it would be. Admittedly we were there in the low-season so it wasn’t as busy as expected. But there was also a pretentious vibe about the place. There were a few restaurants in the bar, however we didn’t find them overly appealing. The Asian style restaurant “Lilin” didn’t have a very exciting selection of gluten free food, and when we enquired at “Tapping Shoes” the French cuisine restaurant, we were told by the waitress that the chef could accommodate us but not tonight because he was too busy. Needless to say, with the amount of amazing food we discovered elsewhere I would not rush back. 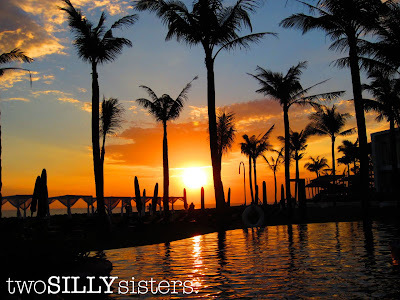 Another great place for viewing sunsets is the “SOS Rooftop Bar” at the “Anantara”. This bar is not very well known, which is a shame because the setting is gorgeous and the cocktails were delicious. All that was missing was a bit of atmosphere. After our drinks we headed to the restaurant downstairs “Wild Orchid” who were also very accommodating to my GF needs. 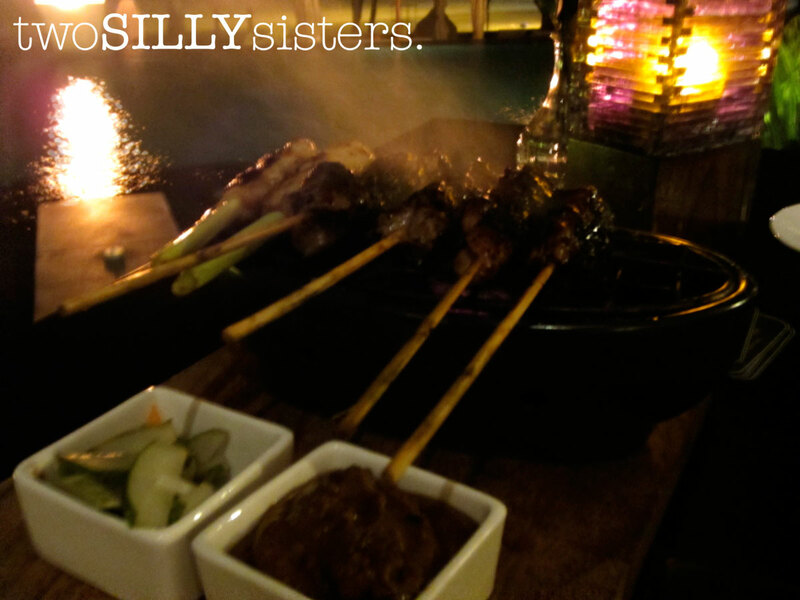 For entrée I had a Balinese style soup, and for main satay skewers of chicken, beef and lamb, which were still sizzling on the plate! We were lucky enough to be there on a night where they had a traditional Balinese dance show. 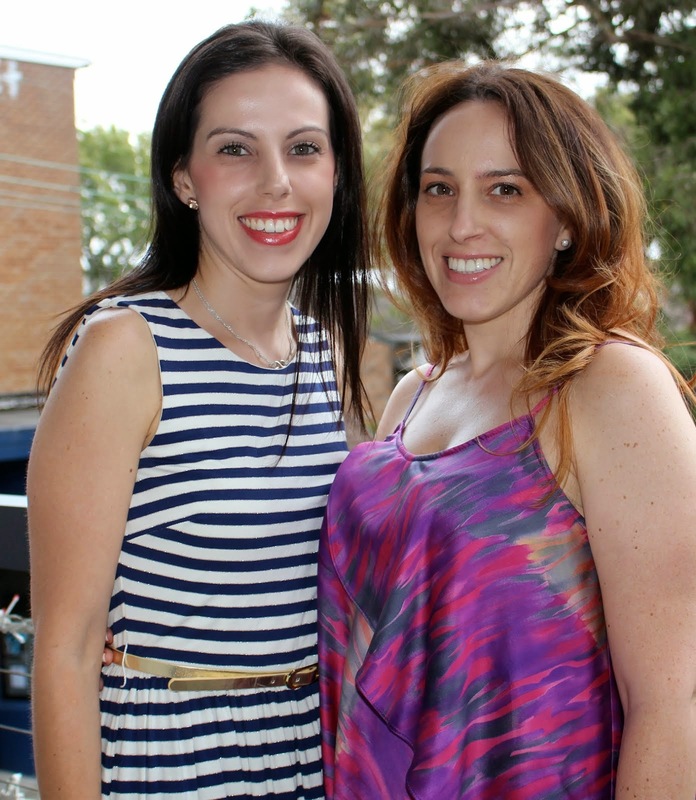 We decided to give our stomachs a small break from Indonesian cuisine and headed to “La Lucciola” one night. 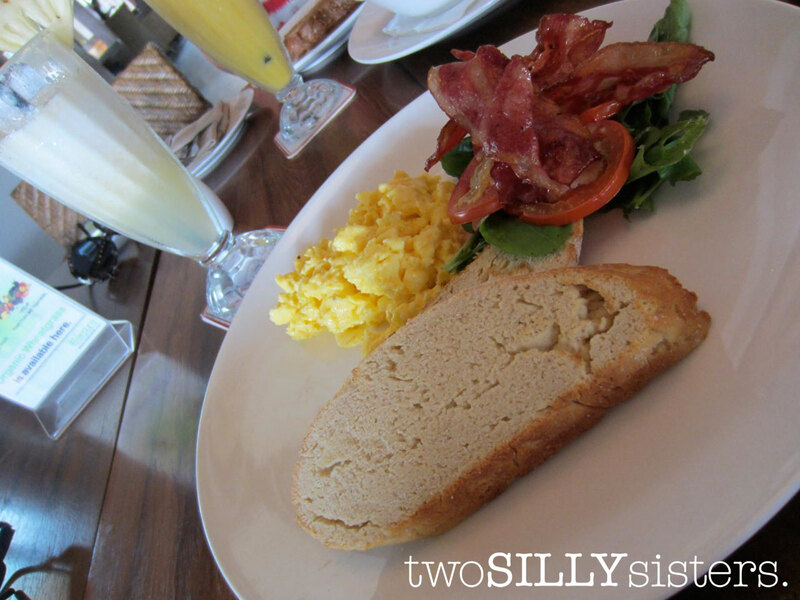 A beautiful Italian restaurant located right on the beach, open for breakfast, lunch and dinner. At night the restaurant is lit up with candles and fairy lights, and looks gorgeous. We had to wait for our table, as we didn’t have a reservation. This wasn’t too bad as we ordered cocktails and some bar food and by the time the food arrived our table was ready. There wasn’t a huge selection of GF from the bar menu but the waiters were kind enough to make me some fresh grilled calamari, which was a nice start to the meal. For mains there was a larger selection of meats and fish to choose from. 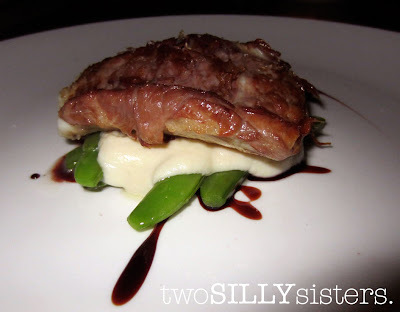 I ordered the “Pan roasted barramundi with prosciutto, celeriac puree, snow peas, and red wine reduction” which the chefs were able to make GF for me. The staff was very accommodating for my needs and very friendly. 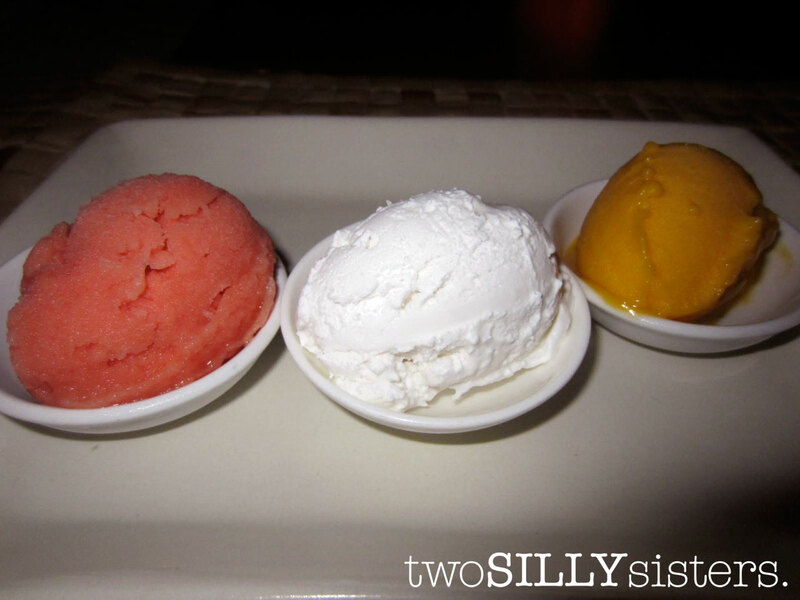 To end the meal on a high, I ordered a trio of Watermelon and Mango sorbet, and Coconut gelato. The entire meal was delicious! A sweet and refreshing end to my meal! Our last meal we decided to stay local, and dine at “Fire”, a restaurant at the W, as we had a late flight to catch. The staff was very helpful, not only for my dietary needs but getting the food out fast, as they knew we had a plane to catch. Although had we known Jetstar was going to cancel our flight, we may not have bothered eating so fast! The food was lovely. I ordered scallop ceviche to start, followed by pork belly served with corn on the cob, coleslaw and a delicious special GF dipping sauce. We arrived safely home with no signs of Bali Belly – however a bigger belly? Perhaps! Terima kasih (meaning thank you in Balinese) for re-living my gluten free adventures in Bali with me, through my last three blogs. I hope you have enjoyed it and I have inspired you to travel. 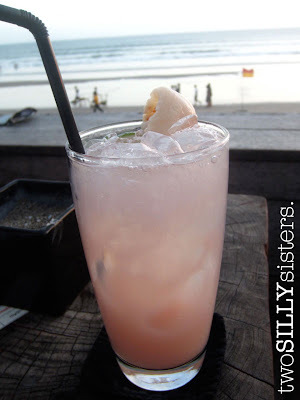 Here’s a list of places I recommend when visiting Seminyak, Bali. Hi Chompchomp, yes we had some pretty awesome meals! That's such a shame you couldn't make it to Sarong :( Hopefully you were successful in the rest of your food exploits! This is just what I needed to read. I am off to Bali next month and have been wondering how I will go with my intolerances. thanks so much for posting such detail! Hoping to get to Sarong for my birthday whilst there! Great experience. Why not try @Warung Petit : jalan Kayu Cendana no 7A. Its delicious and taste food. Thanks for this great post! We are headed to Seminyak, Bali next week. My daughter is celiac and I wondered how she'd fair. Quick question: I notice on your list of recommendations you mentioned Bali bakery and Bali Deli. I think our villa is actually opposite Balli Deli. Do they sell GF bread?? We had wondered if we needed to bring bread, crackers etc from home... Thanks in advance!! Hey Wow !!!!! 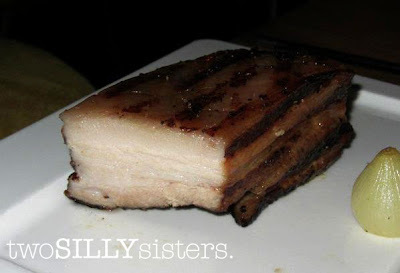 I would like to say this is an great blog.These are such a delicious foods that they simply rise my hunger. I am anxious to watch it.Keep it up Thanks for sharing. Wow, very interesting. The main thing that is very interesting to me during a trip to somewhere is enjoying a culinary tour. and I used to do that with my family. Culinary is an identity for a tourist area. and this is very interesting. nice post. 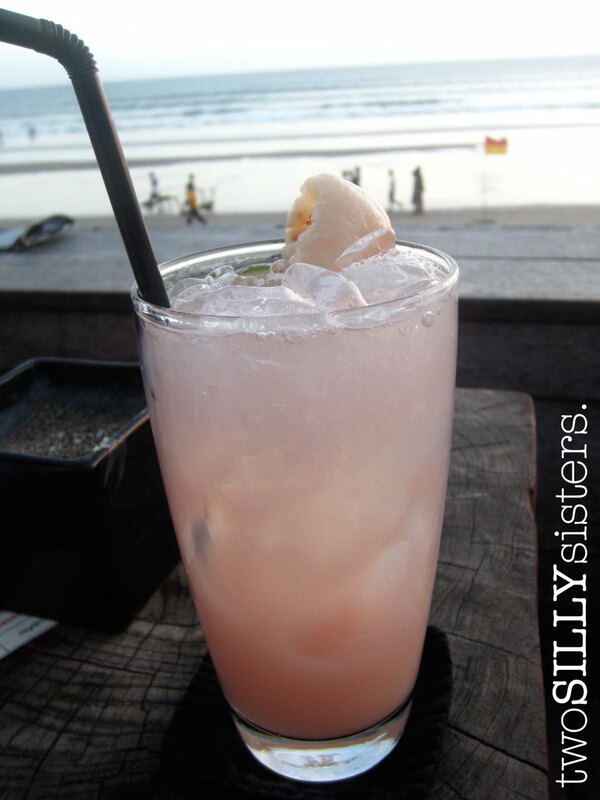 check out these great options in Seminyak!